You will love having this white woman's shirt form to help you with your display needs! Not only are the hooks convenient, but this form has been made shatterproof as well! So, if there is a mishap and it somehow falls, you don't have to worry! Your form will last. This form is also half round and is an open back, injection molded shell. This form will fit women's sizes 4-10. In stock and available for immediate shipment to your door! Fine for hanging just don't drop. Great quality, inexpensive! Will get more of these! Love the quality of this shirt form. Love the forms!Delivery on time as always. Forms add a classy touch to my boutique. Reasonably priced. Very happy. I will be ordering more of these forms in the future. 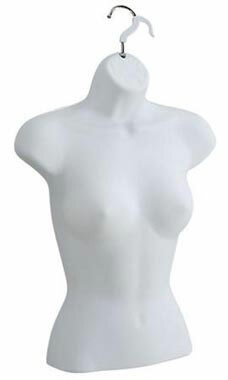 Pair this with the adjustable single costumer and you have a very affordable mannequin fixture. I put small t-shirts over a couple of these to display scarves and aprons. These have a small footprint so several can be used in a small store or boutique space. If you are on a budget, this is the route to go. Great Price - does the job. We've weighted the forms and they stand on a shelf on high. Love how they do the job of forms six times the price! I like my woman shirt form . plastic is very durable and strong, and off course the price cannot be beaten anywhere .Had it shipped from warehouse to Florida to The Bahamas ,and the shipping process was a speedy one. Thank you S.S.W. your service is excellent. I was surprised at how fast my order came and they were better than what I expected. I would order from them again! The time I receive this Mannequin and dress it up with one of my Blouse at my store.It attracts a lots of customers. My sales started to increased.This Mannequin make a huge difference than using a regular hanger,you will be a maze how much more Business you will get by dressing up your merchandise with this shirt Mannequin.I'm very happy and it make my store stand out. I will be ordering a lot more and feel up my entire wall at my store. Thank you so much Store Supply.Joyce's Dream Adult & Children's Clothing Store.. I stand this behind the shorter Necklace stands. I can dress it or ot (but beware that clothing looks baggy unless you use the smaller sizes or lots of pins in the back. Needs something heavy to stand in the back to keep it from tipping forward. I use these without the hanger, and put in a pin to display necklace and earrings or scarves. I was nervous purchasing this online before feeling how thick the plastic was, but I wasn't disappointed!! It feels like it's made from pretty thick plastic. It will last a long time! I know it was just the right purchase!! Received today and this is an excellent product. Taking pictures with shirts on this form is so much better and look better than laying on the floor or on a clothes hanger. Price was ideal and fast shipping. Well made, good low cost option for display on shelves, face outs, tables.